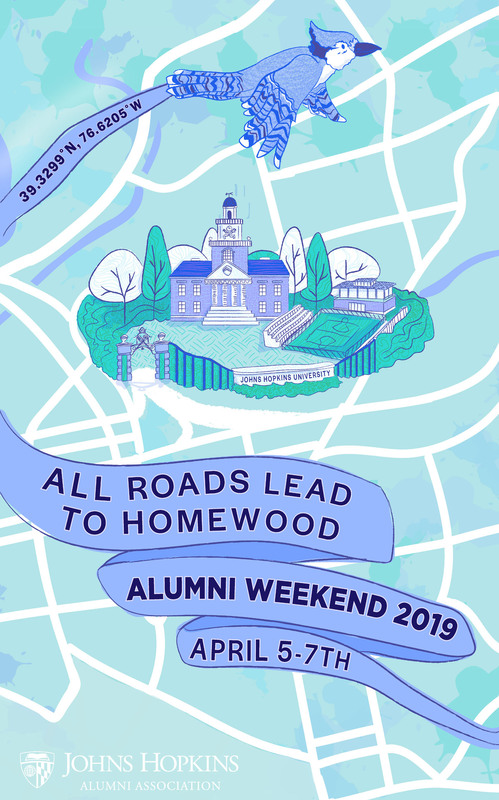 Thank you for an amazing Alumni Weekend 2019 (April 5-7), where we celebrated the milestone reunions for those classes ending in 4 and 9. Check back here in late spring for Alumni Weekend 2020 dates for classes ending in 5 and 0! Want to find out what's going on at Alumni Weekend 2020? The 2019 Reunion brochure consists of important registration details, schedule of main events and class festivities as well as general information to make your homecoming weekend the best experience it can be. To view the PDF click here. Or, if you're special, only four! Depending on the degree you want, this can take up to seven or so years. Alumni Weekend 2020 may come a bit too soon for you. If you’ve completed Step 1, proceed to Step 2. Simply complete your profile and return it by email, fax, or mail. Not only does this help us plan, it lets your classmates know you’re coming. Complete your profile in about 3 minutes. Check back with us after the New Year to find out who's coming back to Baltimore in April! Class parties. Faculty lectures. Taste of B'More. Lacrosse and the pre-game crab cake lunch. Online registration will open January 2020. Find out everything you need to know about accommodations, parking and getting around campus. Enjoy discounted rates from area ins and hotels. Step 5: Show Up. Well post the Alumni Weekend 2020 dates in late Spring 2019! Laugh, learn, meet with friends and let the good times roll! We’ve got answers. We want to make attending Alumni Weekend 2020 as easy as possible. Let us know if you have any questions. Send an email to reunion@jhu.edu or call 410-516-5185. GoHopOnline.com replaces JHU Connect with a secure space that links you with your trusted Johns Hopkins University community. Easy sign-on and sync up with Facebook and LinkedIn let you quickly connect with the people you need to grow and refine your personal and professional networks. Social media feeds keep you updated on Hopkins news, chapters, resources, programs, and more. Become a Hopkins Promoter and help spread the word about the latest news and events going on at Hopkins to your friends, followers, and colleagues on Facebook, Twitter, and LinkedIn. Each time you share content, you’ll earn points for more chances to win prizes. Learn more and sign up at alumnijhu.socialtoaster.com. We are pleased to recognize our sponsors who contributed to your fun and learning during Alumni Weekend 2018. Coming soon! Photos from Alumni Weekend 2019. Right now, check out our photos from Alumni Weekend 2018 and get ready to make new memories in 2020! Click here to make your tax-deductible gift. We have answers. Send us an email or call us at 410-516-5185 or 1-800-JHU-JHU1. GoHopOnline.com replaces JHU Connect with a secure space that links you with your trusted Johns Hopkins University community. Easy sign-on and sync up with Facebook and LinkedIn let you quickly connect with the people you need to grow and refine your personal and professional networks.